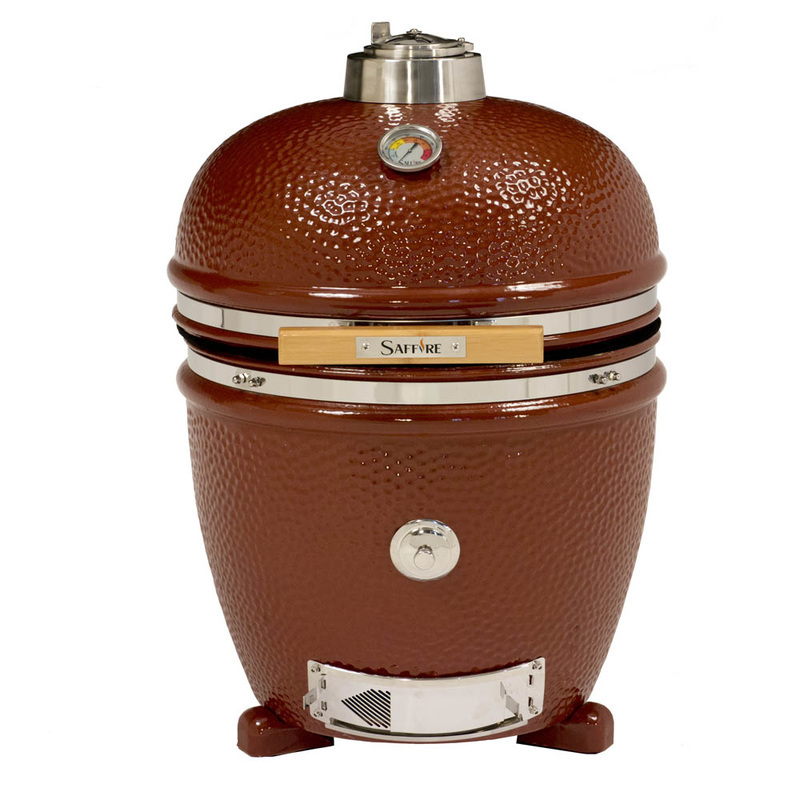 "THE BEST PRODUCTS AND THE BEST SERVICE AT THE BEST PRICE"
The Saffire charcoal fired, ceramic grill and smoker has the most advanced features in its class. With precision flame control the Saffire Grill can produce delicious gourmet results every time. 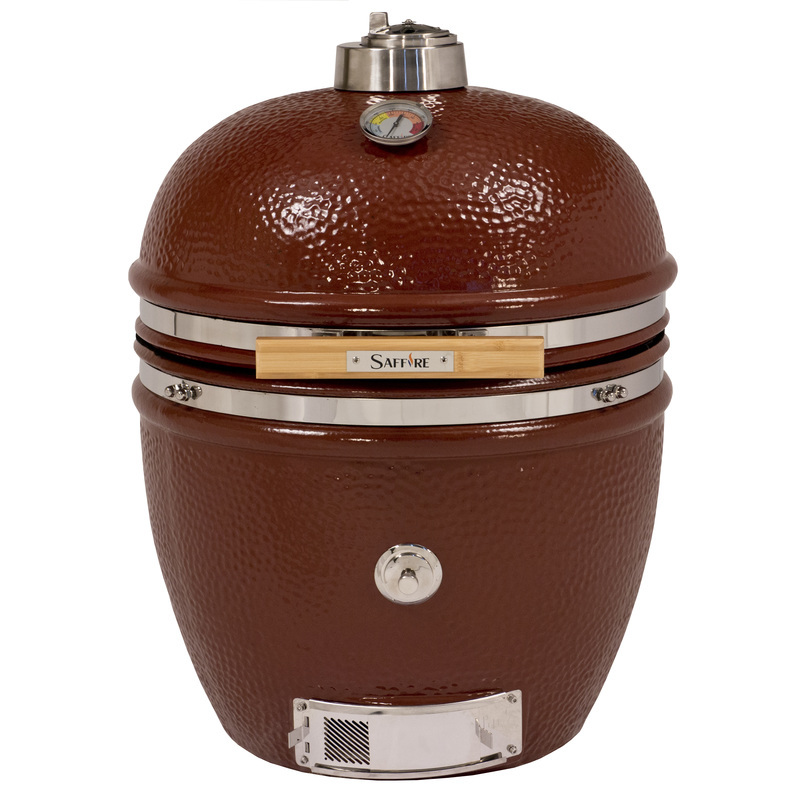 Whether you’re a professional competitor or simply a novice smoking enthusiast, the Saffire grill will provide some of the most exceptional results possible on any barbecue smoker available today. 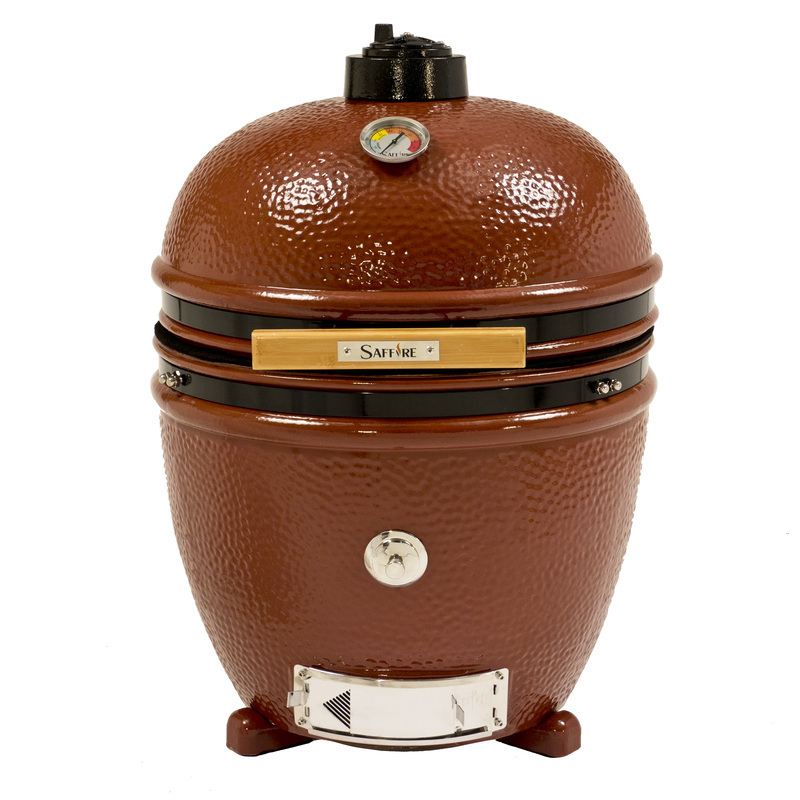 The tight seal and heavy ceramic construction of Saffire holds and controls heat like no other type of grill can. Your charcoal usage will be ½ to ¼ that of standard charcoal grills. 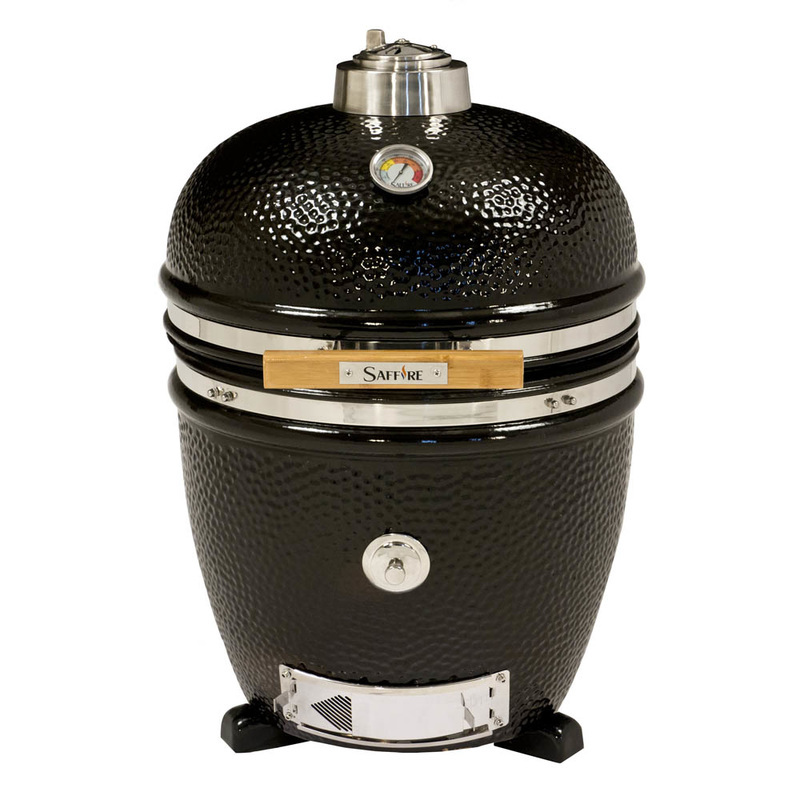 Whether it’s intense heat you require for perfectly seared steaks and seafood or the savor of true slow smoked barbecue the Saffire Grill is for you. You can even use it as a wood fired brick oven for pizza, bread and much more. The high temperature ceramics will give you a lifetime of use. Some of the finest stainless steel alloys on all hardware ensure many years of corrosion free use and minimum maintenance. All this in a beautiful compact design. 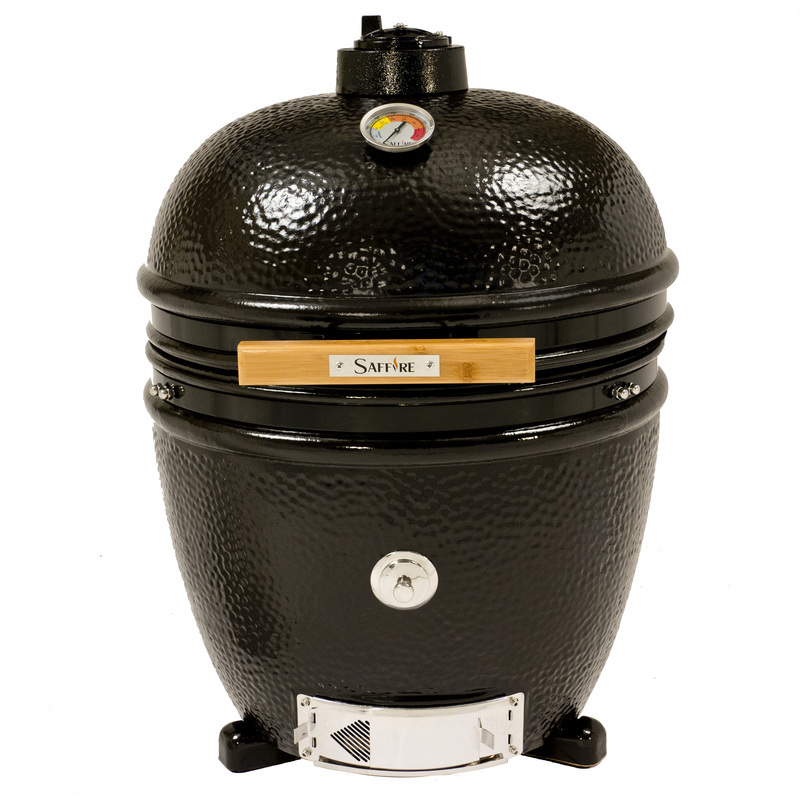 Saffire uses the biggest, thickest metal on our hinge, bands, cart and hardware throughout the grill. This provides strength, stability and longevity. Platinum Series uses the finest 304 stainless steel while the Bronze series uses powder coated galvanized steel. Heavy Duty is almost an understatement for this beefy, rock-solid cart design.The heavy gauge tubular design is extremely sturdy without being cumbersome to handle.Quick assembly.Includes Bamboo Side Shelves with Stainless Steel Tool hooks & Towel bar. Never has it been so convenient to add the perfect amount of smoke to your barbecue. The key is Safflre’s patent pending Smokin’ Chip Feeder. With an extra wide base on the bottom of the firebox the interior components are more stable. The larger area also leaves much more room for ash requiring less cleaning. The bars on the grid were placed closer together to help prevent food from falling through. The Access Door provides access to the fire without removing the cooking grid. Use for adding or adjusting charcoal and wood chunks. 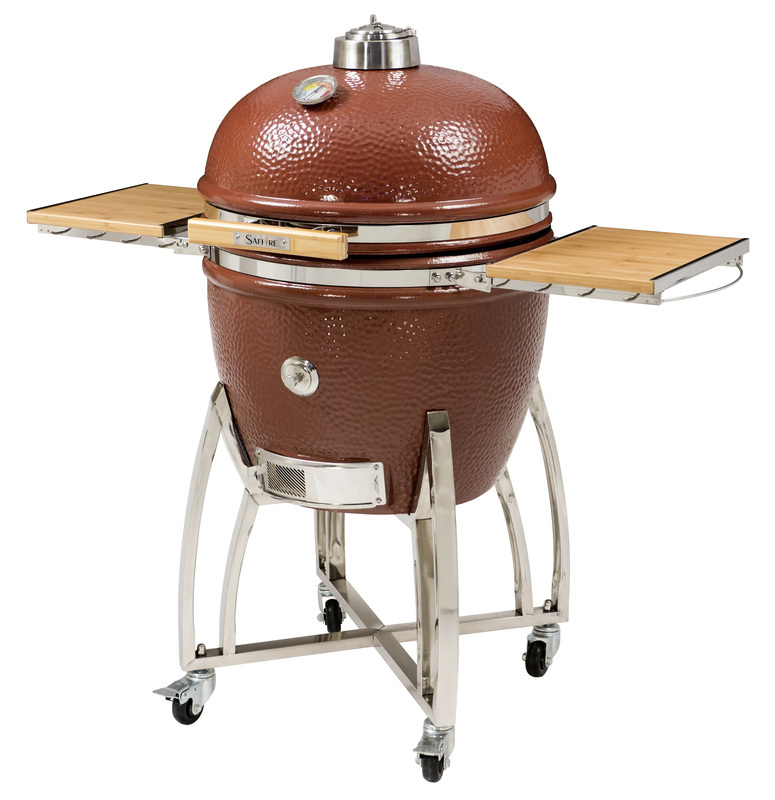 The Saffire Grill may be built in so the cooking area is closer to the countertop height. Our hinge does not pivot downward requiring special cut outs or the grill to be elevated. The presence of this stainless steel plate under the grate tremendously reduces heat loss from the bottom of the grill. Also makes it safe on combustibles with the Build Kit. 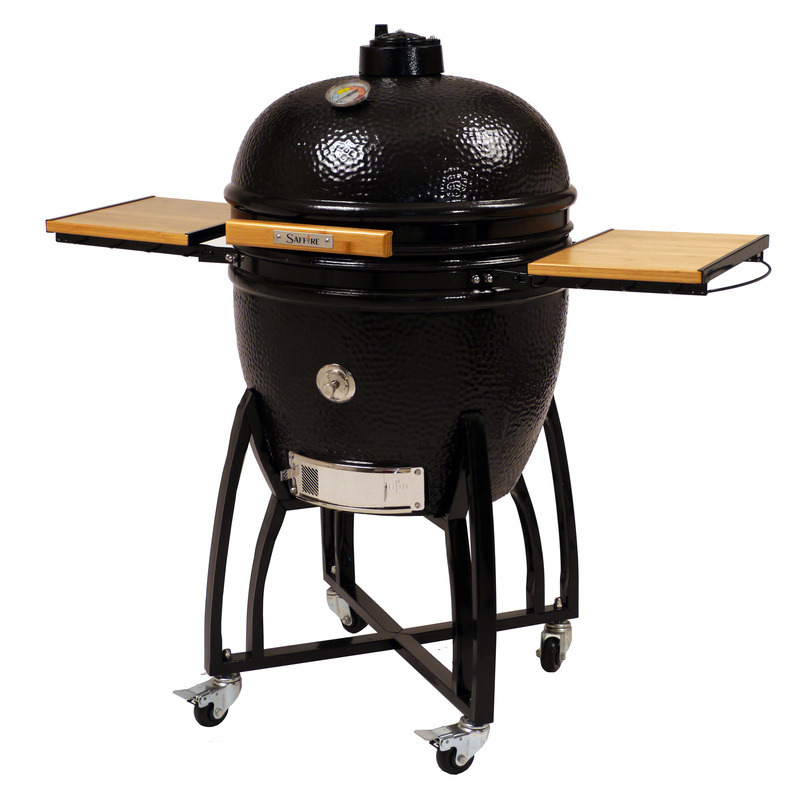 Another feature par-excellence in the kamado industry. Made of solid 304 Cast Stainless Steel! Allows precision adjustment of airflow and grill temperature. First made of Cast Stainless Steel by Saffire! 304* Stainless Steel Caster Wheels (Lifetime Warranty). *304 Stainless Steel incorporates less Carbon and about twice as much Chromium and Nickel alloys as other common, less expensive types of stainless steel. This provides much more corrosion resistance especially around dampness, salt (food, seasoning, sauces or ocean), chlorine (cleaning agents and swimming pool) and other corrosive elements.